Liner notes in English and Finnish. Lyrics with English translation. This is a siblimely beautiful yet rapturous recording. Die kolossalen Turmbauten von den Bassi profundi bis in die leuchtenden Höhen, die ekstatischen Andeutungen in den Alleluja-Abschnitten, die spürbare Freude der Lobgesänge, dazu die verwirrendbetörenden „Frequenzen" der gesummten Orgelpunkte - auch nach mehrfachem Erleben verliert diese Veröffentlichung nichts von ihrem spezifischen Zauber. Und das ist ... das Beste, was eine Tonträgerproduktion bei Werken wie dieser Vespermusik überhaupt zu leisten vermag. This performance, by 'probably one of the finest choirs in the world today' ... and its modern and refined sound, ensure for this disc a place amongst tht most satisfying available. One of the world's finest choral ensembles singing one of the 20th century's choral masterpieces; that is all you need to know. 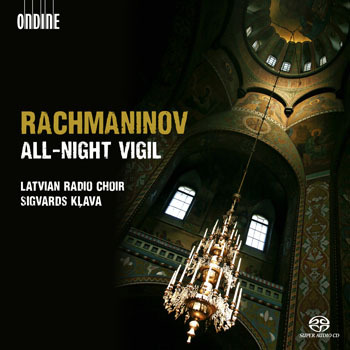 This new release of Rachmaninov's All-Night Vigil follows several earlier releases featuring the acclaimed Latvian Radio Choir under its Artistic Director and Principal Conductor Sigvards Kļava. Inspired by the words, music and atmosphere of Russian Orthodox worship, Rachmaninov created with his Liturgy of St John Chrysostom (ODE 1151-5) and his All-Night Vigil two supreme examples of choral writing but also music of uplifting spiritual strength. The Latvian Radio Choir is regarded as one of the top professional chamber choirs in Europe. The repertoire extends from the Renaissance to the present day, and its main focus is on exploring the capabilities of the human voice and seeking to push its limits.